--Samuel Taylor Coleridge, "The Rime of the Ancient Mariner"
Plastic, plastic, and not a drop to drink? This is a travesty about which we should all be ashamed. Will we be like the mariner, forced to pay for our treatment of these legendary birds? Or will we wake up and clean up our own messes as our mothers instructed us to do as children. again and again he's dragged down by the weight of those wings. Will we be dragged down by the weight of the albatross's wings? 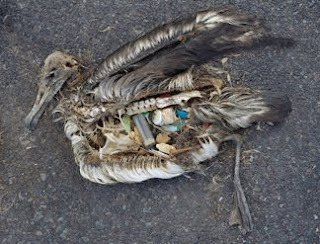 Those plastic-infused wings wrapped around our necks, choking us with the weight of our own detritus.